nice!! 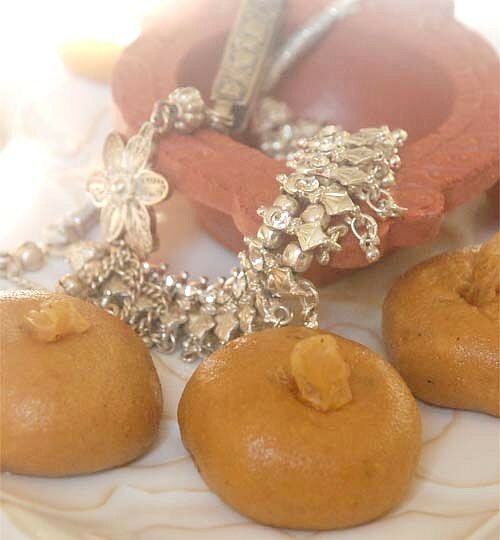 Wish i'd seen this recipe before I made besan ladoos the one hour-arm/back aching way :) Happy Diwali to you! ei diwali te ami khub alsemi korchi...kichhu banaini ar banate icheo korche na. tomar ei recipe ta try kara jete pare...darun dekhte hoeche. Onek din pore eelam to read your blog. 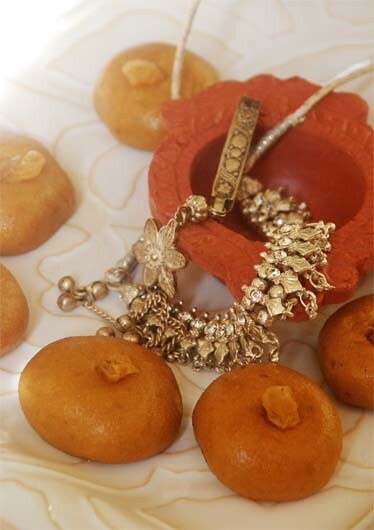 The besan ka ladoo looks nice, soft and easy to make. Will try it sometime. But I need help too. I have signed up for appetizer for a diwali potluck. Give me ideas please ! On that note, Happy Diwali to you and your family. Happy Deepavali to you Sandeepa. Those laddoos are in fact delicious. I am making laddoos too a different kind with split green gram. I did spend about 30 minutes roasting the dal this evening and would spend another 30 minutes making them tomorrow evening. I usually scrimp on the ghee but being Deepavali and all I am going full tilt. What say you? Oh thanks for giving us a recipe for 6 laddoos.And so little ghee. Yesss. Awwww...thanks so much for the mention Sandeepa. 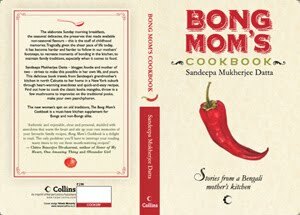 This is such a keeper recipe from Bhaatukli that I can't thank her enough. Happy Diwali to u n ur family! thank u for offering so beautiful looking laddoos. and i liked the piece of jewellery. what is it? ei rannata ami korechhilam ekbar. Old-fashioned poddhotite. 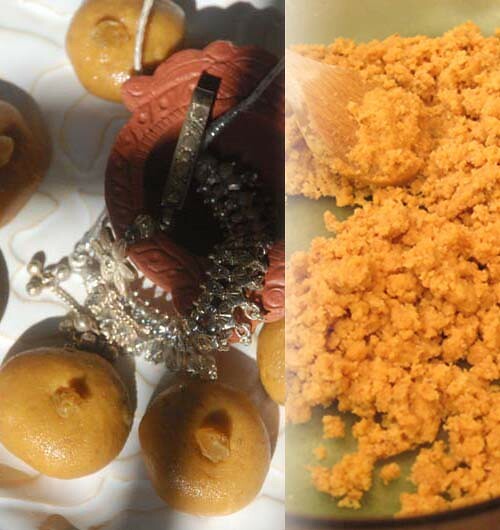 ghonta 5-ek pore haater byathar chote laddu khawar anondo bindumatro ter paini. naakkan mulechhilam, ar omukho hobona bole. tobe eibhabe korle arekbar cheshta kore dekhai jay. This must be one of your funniest posts. A very happy Deepavali to you! Happy Deepavali Sandeepa to u and ur family! I love short cuts and the microwave magic! Haven't done the besan ladoo yet like ur presentation! 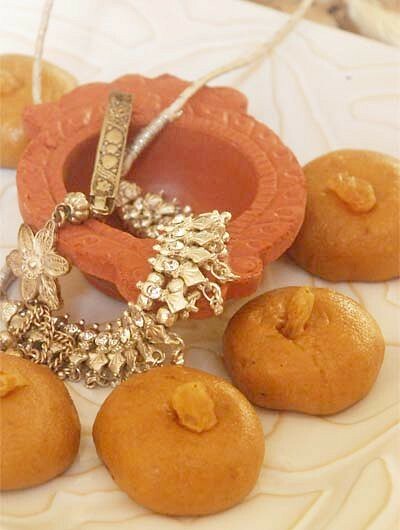 Happy diwali wishes Sandeepa, besan laddoos looks damn cute..
That's definitely a nifty recipe to have! Though the kaddooa seem much moister than besan laddoos I have seen here. And yes I did get the book y'day :-) what a perfect Diwali gift! I'm almost through the book- it's great ! Coming here after a loooooong time.Looks like missed a quite a list :( .Loved the besan ladoo..easy to make. Super liked the picture. happy diwali and thanks for the microwave version of these cuties.. i too love these but hate making them the looooong way! I am regular reader of your blog and count on your recipes. I was overjoyed by the simplicity of this recipe and started right away on it, only to realize at the umpteenth moment that there is no mention of the microwave power anywhere! Went back to other tagged links and finally found a random "microwave on high".. which proved not to be the "high" on my microwave. Thankfully, the final outcomes were fairly good on the assumptions of a reasonable heat and time after a total messy first round! Hope to see more of these technical details with a recipe that depends mainly on a device. I understand your problem. But for someone like me who always uses the MW at full power unless it says explicitly, guess this never crossed my mind. The trouble also comes from the fact that my purpose is not really to teach people perfect cooking steps(heck, I am not that kind), there are much better resources for that. What I think I try to convey is a love for food and cooking and a belief that anyone even a working mom with two kids can still cook sweets on festivals without losing sleep. Once someone has set out on that road, an adjustment in MW power comes easy :) And messing up is totally ok. I did that even after I made a successful batch the first time. tomar recipes khub bhalo laglo...ekta mishti doi banai ami khub bhalo hoi...baniye dekhte paro...greek yogurt aar carnations er caramelised condensed milk (dulce de leche)equal portions e whip kore micro for 5 mins...ektu observe korte hobe jate bubbles na hoy...3 mins kore ektu wait kore abar 2 mins...khub bhalo hoy...ekdom kolkatar mishti doi.. Thank You Aditi, that sounds really easy. Will try definitely. i like this post it is so nice. I made this today for a bunch of my friends and they loved it! Thanks for sharing the secret. This is amazing... They came out sooooooooooooooo delicious! I can't believe I made besan ladoos in the MICROWAVE!!! You are a Kaam Chor Goddess! Thank you from a fellow Kaam Chor! Wow, these were just like the ones I buy from a good mithai shops. Actually they were better because I used desi ghee and the fact that they were sooo fresh. They are the easiest to make too. Thank you. I tried your laddoos today, the first round being totally messy. The besan got burned and in the next round I put more ghee so it tasted nice it was not binding . I put it in a tray and made it into barfis. Can you please mention the heat in the microwave. The binding comes with the sugar. As you mix the sugar with the besan and ghee, it starts coming together. I am in the US. MY MW does not have a heat option. I used it at 100%Power which is the default option. last step e tumi je sugar add korte bolecho seta ki powdered sugar na regular fine sugar jeta amra use kori(granulated na).... recipe ta anoboddo...can's wait to make it.